Terrific bungalow made extra special w soaring vaulted ceilings throughout main level. Large skylight in kitchen, in combination w large windows, floods open concept space w lots of natural light. Spacious great room has a corner fireplace w built-in shelving above & views out to green space & COP. Kitchen is in the centre of home & has oak cabinets, a large island w seating, corner pantry, white cabinets & white appliances. Dining nook steps out onto a large, low maintenance deck that spans back of home & is also accessible from the master bedroom. Step down a few stairs to a lovely, fenced backyard that is beautifully landscaped w mature trees. Downstairs offers a large rec/games room that can accommodate a pool table (which can be included if the buyer likes), a fireplace & wet bar, two more bedrooms & a bathroom. Front flex room could be a home office & is conveniently located next to the large entry making easy access when meeting w clients. Quiet street! 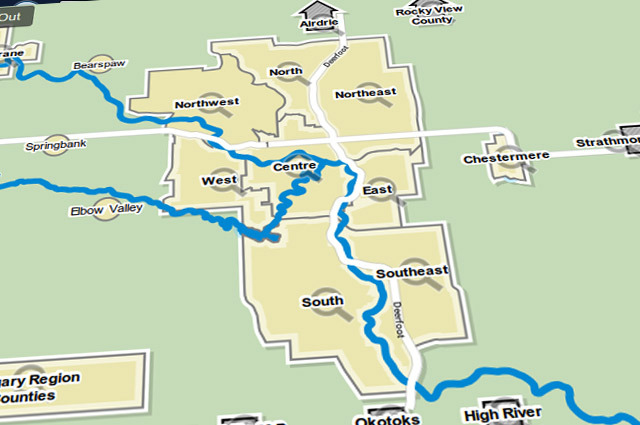 Steps to Bow River Pathway & natural ravines!